The invision community system sets up emails via the email template system. 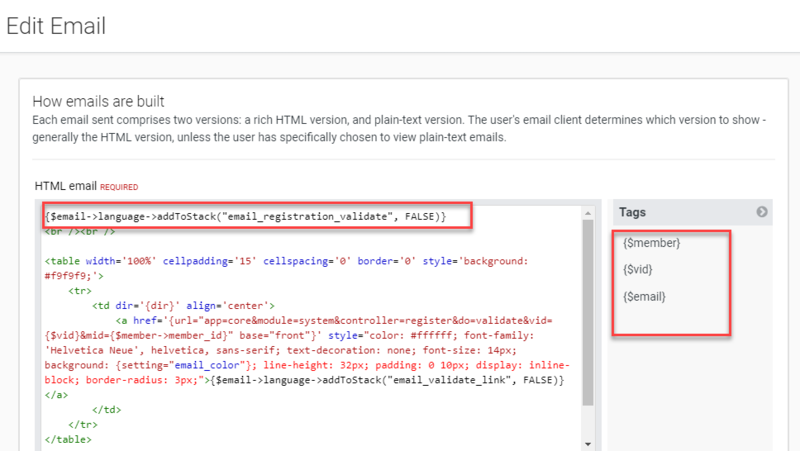 This gives you the ability to amend the email structures from within your ACP, without the need to edit any core files. The following guide shows how the Email Template system works, and where you would be looking in order to change a particular email. The email template structure is made up of 4 parts, in which you would need to be aware of to make changes to your emails. Email Wrapper Template - The email wrapper is the surrounding template for all emails. Each email type will be 'wrapped' by the email wrapper when building up the email, and so is where the basis for the look of your emails would be changed. Note there are some examples of templates which do not use the wrapper. These are specified in the template name, as shown in the example below. The wrapper can be previewed at any time. using the button provided at the top of the template list. Content Templates - All other templates are the body of specific emails, and would be the contents that sit within the email wrapper. For example, you may see an item such as 'Staff Reply', which is the email template for when staff respond to a ticket. This is the template for the content of that email, which would then be pushed into the Email Wrapper. Tags - These are items which are specific to an email type. You will see an available list of these in the side of the editor for each template. For example, the email wrapper has tags for subject, member, content, unsubscribe and more, which can be placed within the template. Templates for emails work in a similar manner to that of theme templates. Any tags available will be shown on the left, and can be clicked to add to the email template itself. Additionally, below is a highlighted example of where you would look at a language string to change content. In this case, the language string email_registration_validate is used, so you would visit that language string to change its contents.